The ability of police in Scotland to detain suspects without giving them access to a lawyer is a breach of human rights, lawyers will argue today, in one of the most significant challenges in recent times to criminal procedure in the UK. 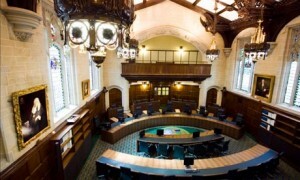 The Supreme Court will examine Scottish criminal law, which gives police up to six hours after arrest to question suspects without a legal representative. Critics say the rule – which leaves Scotland as one of only five countries in Europe that do not allow immediate access to a lawyer – is a violation of the right to a fair trial. “This is a weakness of the Scottish system and will have a propensity to encourage miscarriages of justice,” said Roger Smith, director of human rights body Justice, which is intervening in the case. The claim is being brought by Peter Cadder, a Scottish man who was convicted of assault in part as a result of answers he gave in an interview where he had not had legal advice. The case will be put that Scottish ministers should change the law, bringing it into line with other parts of the UK, where an arrested person has the right to consult a lawyer at the time of their choosing. The law in Scotland has developed differently from that of England and Wales and of Northern Ireland, where a person held in custody is entitled to consult a legal adviser privately at any time. Inside the EU, only Belgium, France, the Netherlands and Ireland take a similar position in not affording a right to legal representation in interview. Today’s case follows a 2008 ruling by the European court of human rights, in which the court found unanimously against Turkey after a juvenile was interviewed by police without access to a lawyer. But lawyers point to the longer detention periods in England, where suspects can be held for 24 hours before being charged with an offence, compared with the six-hour limit in Scotland. Changing the right to access to a lawyer in Scotland could also have wider ramifications for the criminal justice system, experts say. In England, the failure to comment in a police interview under caution – where a lawyer is often present – may be used against the defendant at trial. This system, known as “an adverse inference from silence”, has been earmarked for change by the coalition government as one of its measures on restoring civil liberties. Leave a reply on "Guardian Law News: Supreme court to rule on suspects’ access to lawyer under Scottish law"